Are you related to George Washington? You need an ancestry investigator. Is Brahms your great-great-great grandfather? You need an ancestry investigator to prove it. Was your great-great grandfather killed back in 1849 in Austin, Texas? You need Lucy Lancaster, ancestry investigator, to prove it. Gus Halloran is the patriarch of one of Texas's most powerful families and hired Lucy to research his families' genealogy. His great-great grandmother always swore her husband Seth was murdered but was mocked for what she said after a verdict that he was run over by a horse. Lucy found a picture of the dead Seth, with knife wounds, taken by a witness to the murder, Jeb Inscore, photographer. Lucy even found the daguerreotype of the very dead Seth in Jeb's relative's house. In Jeb's journals, which were also with the daguerreotype that Lucy found, he tells how he was forced to lie about what happened by a powerful man who threatened his family, someone Jeb only called C.A. C. A. was a veteran of the Texas Revolution of 1836 and a member of the Texas Legislature. Funny thing, Gus's son is running against Daniel Applewhite, the ancestor of Caleb Applewhite, who served in the United States Senate back in 1849, and one of two men with the initials C.A. The other C.A. was Cantwell Ayers, a contemporary and rancher whose lands abutted both Caleb Applewhite and Seth Halloran. When Gus has a press conference announcing Caleb Applewhite was related to his great-great grandfather's murder, and calls Lucy forward to discuss how she found out, sinus medication on top of three martinis makes her unable to remember what in the world she said the night before. But when the old lady who had Jeb's pictures and journals house is broken into, and her friend in the Hamilton Center at the university is murdered and some of the daguerreotypes from Jeb's collection stolen, the FBI is called in. Special Agent Ben Turner is assigned to the case and is trying to keep Lucy alive and Gus from stirring up more trouble. S.C. Perkins' story is incredible and interesting, especially for people just beginning to be interested in their ancestry story. Told from Lucy's point of view, we see how dedicated and smart she is in doing the research in the field she loves. Lucy even teases Ben when she finds out his mother wants to prove she could be a member of the Daughters of the Revolution. That freaks Ben out and he vows never to give her the information. You'll have to read MURDER ONCE REMOVED to see if Lucy finally wears him down. Secondary characters are Gus and his family, Lucy's friends Serena and Josephine, and Lucy's friend Winnie Dell, who died to protect some information she found behind a picture. And I dare not forget Julio “Big Flaco” Medrano, owner of the best taqueria in Austin. 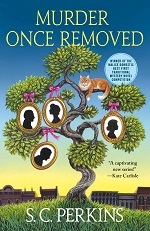 MURDER ONCE REMOVED ticked off the boxes in my mind to a Perfect 10 story with a stimulating story and exciting mystery filled with quirky, original characters. So seldom am I entertained with a novel different from anything else, and best of all, it appears there will be more stories to come--YAY! If you love cozy mysteries with brains instead of blood, grab up MURDER ONCE REMOVED this month.